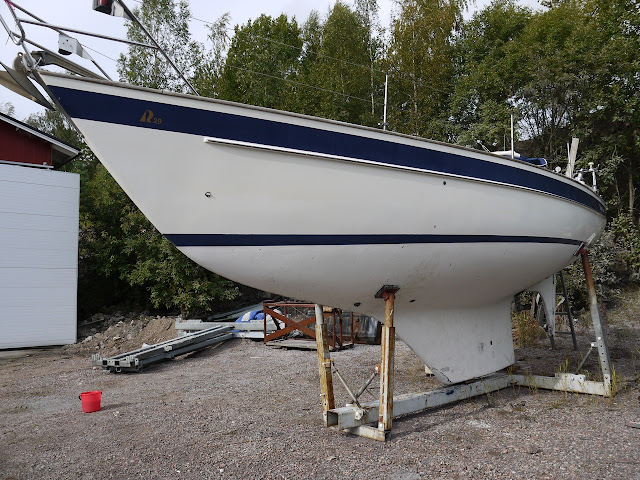 Our renovation project got a kick start on weekend, as the underwater hull and keel were soda blasted clean of old epoxy barrier coat and multiple layers of old antifouling. 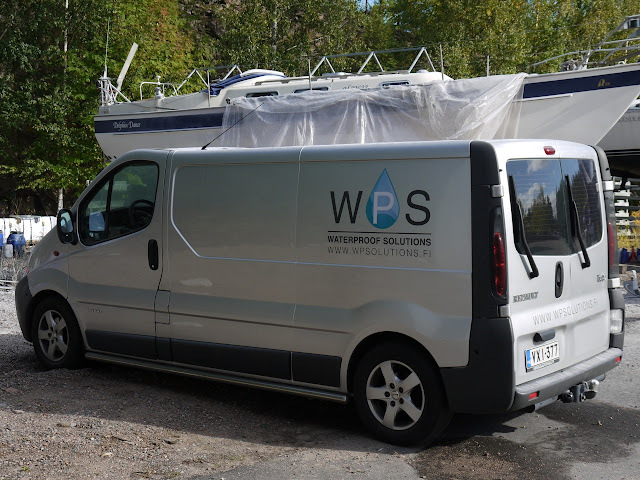 The work was done by Samuli and Toni from the company Waterproof Solutions Oy. 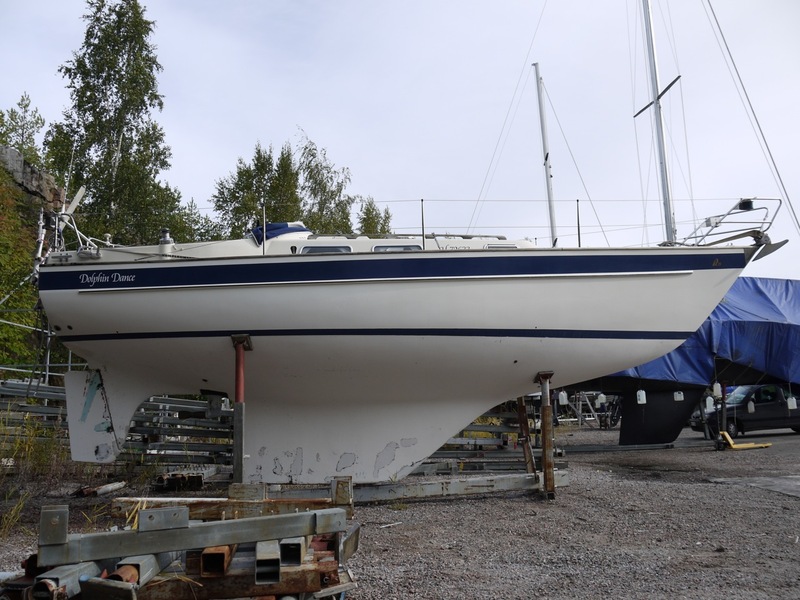 I actually started scraping off old bottom paint from the keel last autumn, but soon it became evident, that it would take ages to clean the whole bottom this way. Hand scraping the bottom during the dark November evenings did not sound too tempting either. 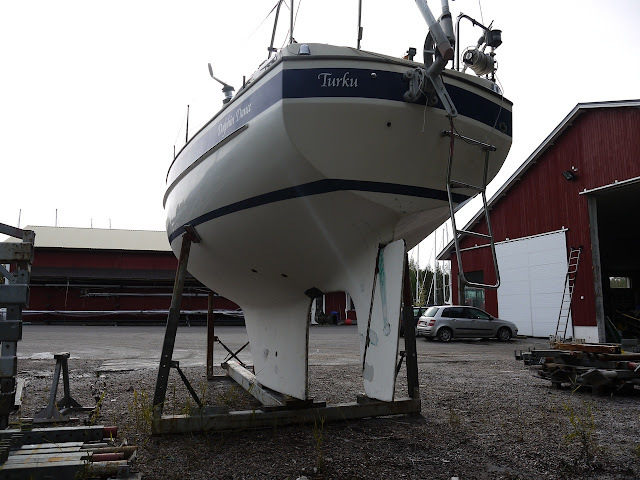 Furthermore, it is very important that the hull has enough time to dry before applying new epoxy barrier coating. Thus, old bottom paint should be preferably removed already at autumn. In general, fiberglass is not totally waterproof, so epoxy barrier coating is required to the underwater parts of the hull. Full bottom paint renovation is an expensive and time consuming job, but when properly made, it should give a long-term protection against osmosis. Therefore, it is rationale to try to get it right the first time, since there have been many occasions where hull develops blisters just few years after renewing the barrier coat. If the hull is still wet when applying the barrier coat, the moisture is sealed in the hull. 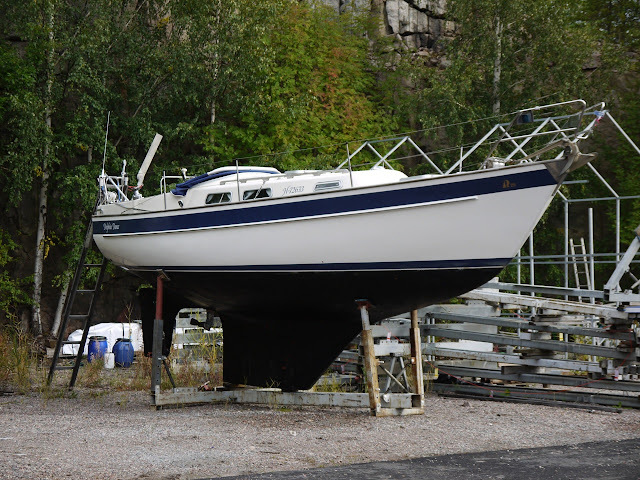 In Nordic countries the winter lay-up period is often as long as six or seven months, so the hull has a chance to dry during the winter. 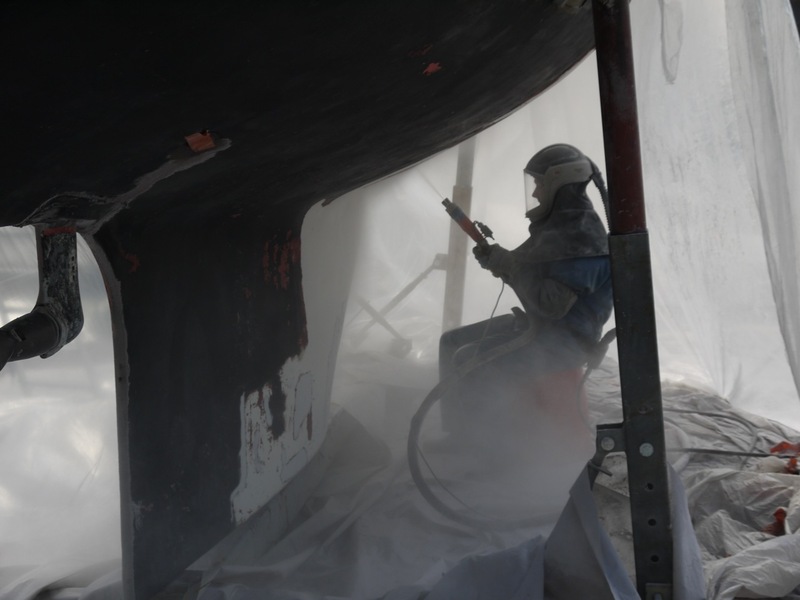 However, in case the hull is wet, the new and more effective barrier coat hinders this drying process and may result in blistering in a few years time. Thus, it is important to get proper moisture readings from the hull before applying new coating. We decided to have the underwater hull blasted right after Dolphin Dance was hoisted out of the water. 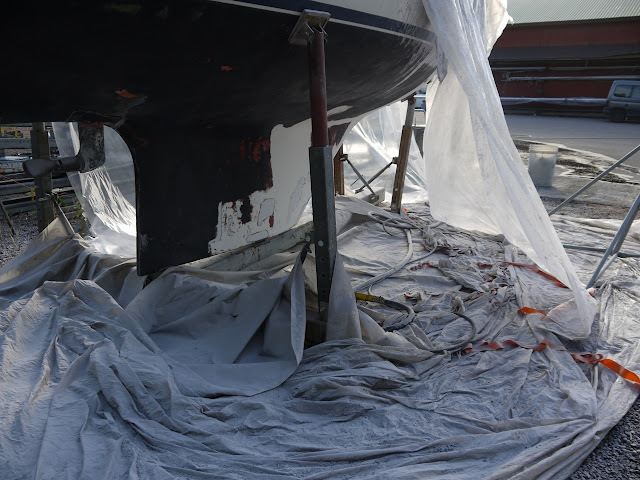 New barrier coat and antifouling will be applied in the spring. For removing the old bottom paint, we opted soda blasting, which I consider the most advanced and environmentally friendly hull cleaning method. It is gentle for the gelcoat surface compared to sandblasting where a lot of gelcoat is potentially lost. In soda blasting, basically a normal baking (or cooking) soda is sprayed against surface using compressed air. Soda is a natural and water-soluble product, so the residues can be rinsed with water. Waterproof Solutions is run by two sailors, so they have expertise in boating. The company offers also moisture measurement and osmosis analysis services. Furthermore, they have ozonator and spray extension cleaner equipment for rental, which we tested already at spring. Blasting the bottom of Dolphin Dance turned out to be quite a challenging case, because the old primer was sticking very strongly at some places. I am not sure what epoxy primer Hallberg-Rassy used twenty years ago, but it seems to be sticky! Therefore, some spots were blasted with a glass bead instead to improve the efficiency of the blasting. In general, I am very pleased with the outcome since the surface is mostly ready for applying epoxy coating after just some light sanding. At some places, where the glass bead blasting was used, some filling and fairing with epoxy is required before applying a new barrier coat. 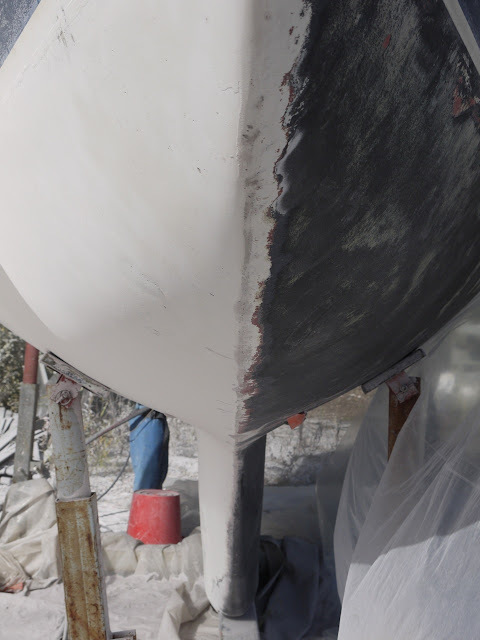 The cover under the boat gathers the bottom paint, so it is not left to harm the environment. Dolphin Dance stripped naked! 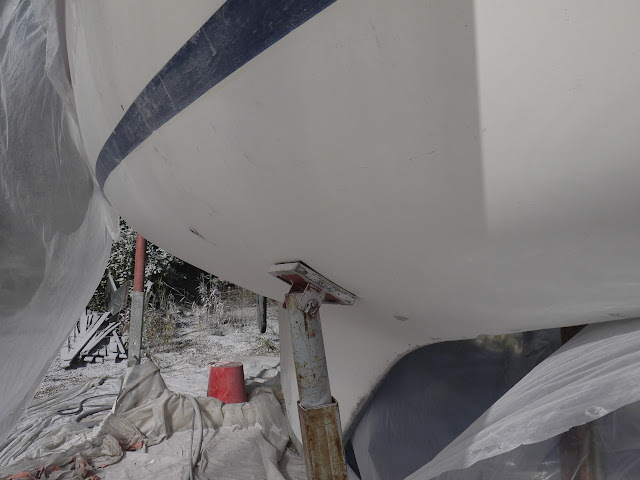 The spots on the keel where scraped off last autumn, and primered in spring. Terve, soodapuhalluksen hinta rungon osalta on n. 100 € per metri ja köli on sitten muutaman satasen päälle, eli meidän veneelle (n. 9 m) hinta 1200 € sis. alv. Mutta kannattaa pyytää tarkka tarjous WPS:ltä omalle veneellesi. Hei, kiitos tiedosta, samankokoinen vene meilläkin. Miksi sitten päätitte poistaa myös epoksin? Miksi ette vain poistaneet myrkkymaalia ja laittaneet uutta epoksia vanhan päälle? Muutamista paikoista veneen pohjasta se epoksipinta oli kulunut pois ja alta paistoi gelcoat. Noita kohtia paikkamaalasin parina edellisenä keväänä, mutta nyt ajateltiin ottaa koko pohja puhtaaksi, että varmasti tietää mitä siellä on. Varmaan homman olisi niinkin voinut tehdä, että olisi jättänyt vanhat epoksit pohjaan! Tuli tosin yllätyksenä, että vanha epoksi istui paikoin niin tiukassa.